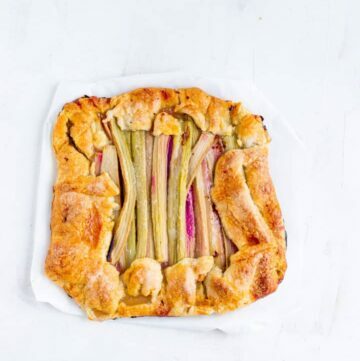 This rhubarb galette is the perfect summer treat. 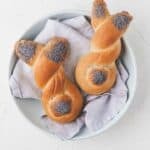 The hint of sour from the rhubarbs combined with a homemade pie dough sprinkled with sugar is an excellent choice for dessert. And it also looks very pretty. 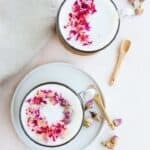 What you must know before making this recipe is that rhubarbs do lose water during cooking or baking. Adding flour will help the watery juice from the rhubarbs thicken a bit. 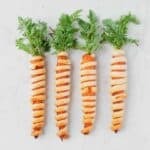 Nevertheless, there will still be juice from the rhubarbs running out during baking. 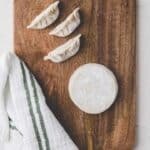 It doesn’t impact the taste or crispiness of your dough, but it can get a bit messy if you don’t use a large enough baking sheet to cover your whole baking tray. In the last 5 minutes baking time, leave your oven door ajar which will help to make the pie dough extra crispy. 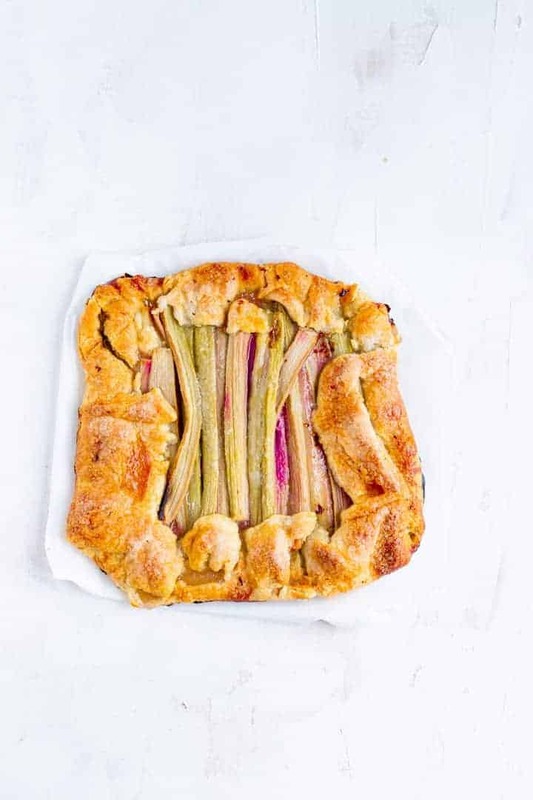 So, if you can live with the fact that some juice will run out during baking this rhubarb galette, go ahead and start making it. 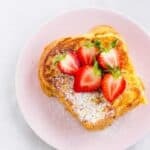 Otherwise, consider baking a galette with strawberries or another fruit which doesn’t lose so much water during baking. 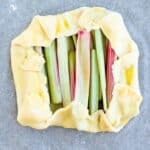 Homemade pie dough filled with rhubarb and sugar. 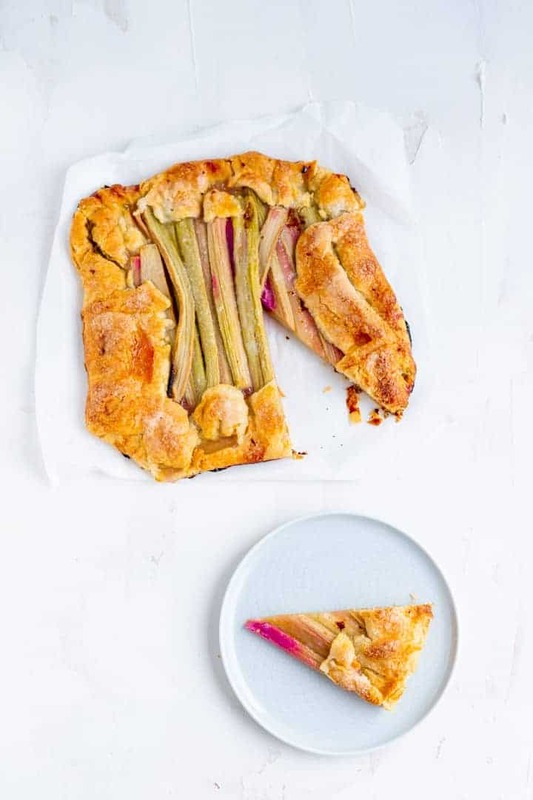 This rhubarb galette is the perfect summer treat. Mix the flour, sugar and salt together. 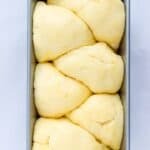 Add cold butter in little pieces to the dough and mix it in your kitchen machine using the k-beater (Kenwood) or flat beater (Kitchen Aid) until resembles coarse crumbs. Add the apple vinegar and water and mix until you have a smooth dough. 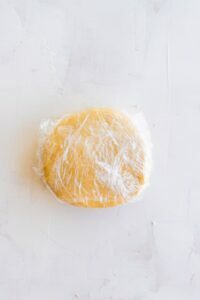 Form into a disc, wrap in plastic foil and refrigerate for one hour in your fridge. On a floured working surface, roll out your dough to 30cm/12inch. Transfer on a with baking paper lined baking tray. Aline's Kitchen Hack: Roll your dough on to your rolling pin to transfer it. 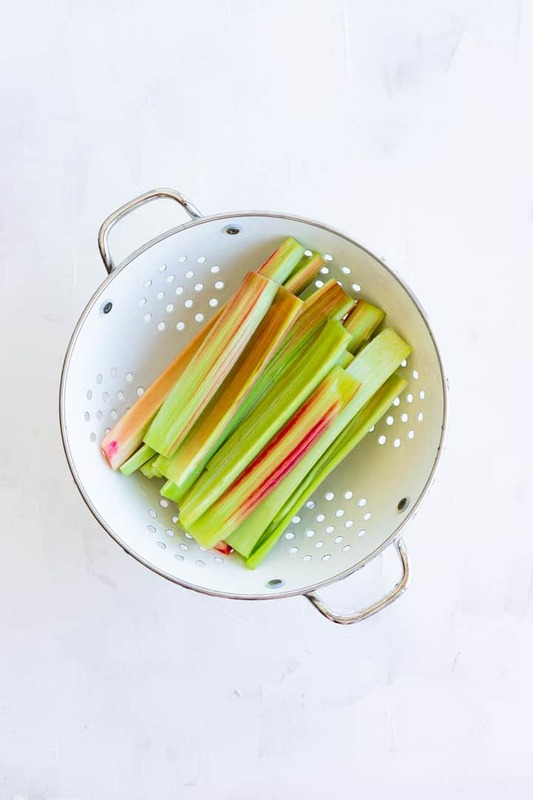 Trim the ends, peel, and wash the rhubarb - You will end up with about 400g rhubarb. Cut into ~15cm/6inch sticks and then cut them lengthwise. Mix with the sugar and flour. 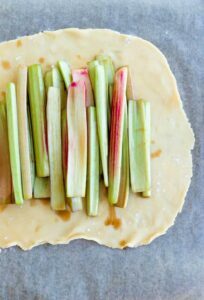 Place the rhubarb filling in the middle of the rolled out pie dough. 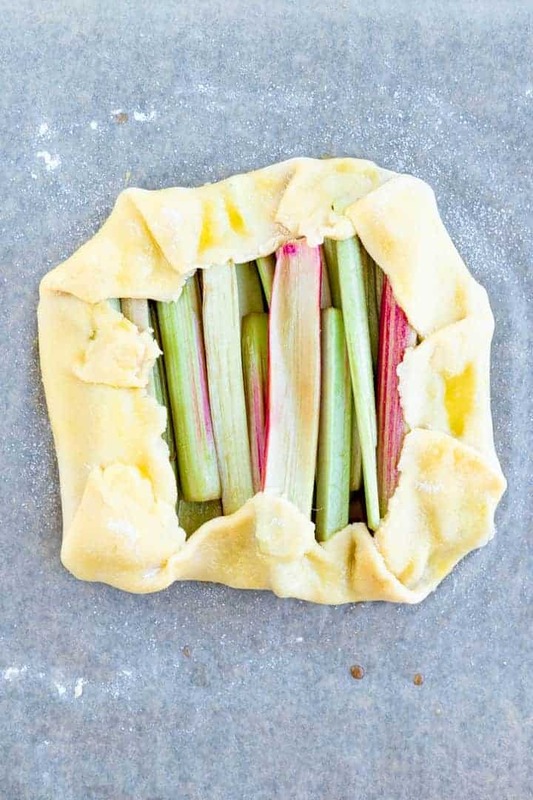 Fold the remaining dough over the rhubarb and press slightly to seel it. 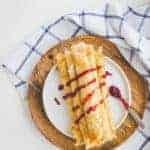 Brush the dough with the beaten egg and sprinkle with one tablespoon of sugar. 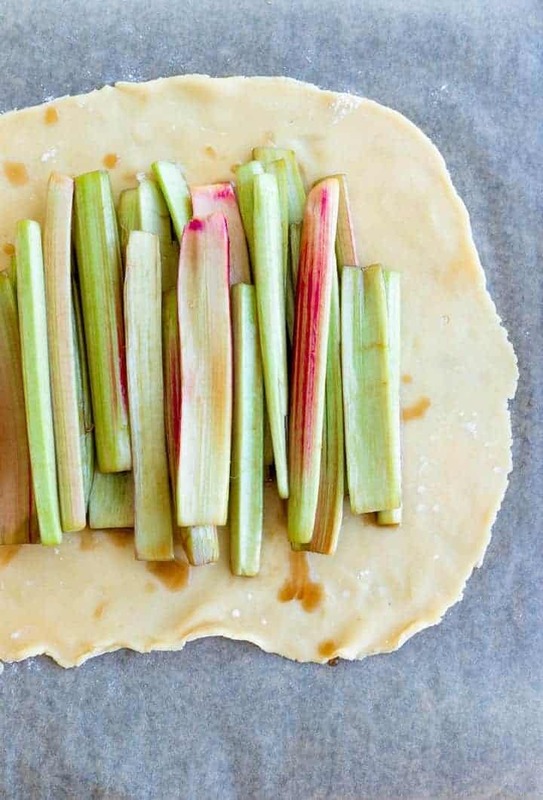 Bake your rhubarb galette for 40 minutes at 200°C/400°F in your oven. 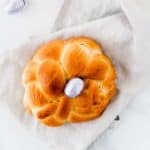 In the last 5 minutes, bake it with the oven door ajar (stick a wooden spoon between the door and oven), this will make the dough super crispy. Let it cool down on a cooling rack for 15 minutes before serving. 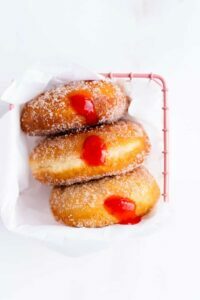 Sprinkle with sugar if you have a very sweet tooth and it's too sour for your taste. 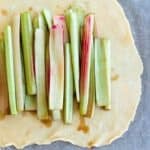 Rhubarb is losing a lot of water during baking or cooking. Adding one tablespoon of flour will make the "rhubarb-sauce" a bit thicker. Nevertheless, there will be some juice from the rhubarb running out of your galette during baking. 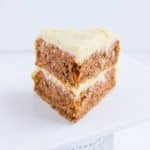 Make sure to use a baking sheet which is big enough to cover your baking tray in order to not have to clean it afterward. If you can live with that fact, go ahead and start baking. 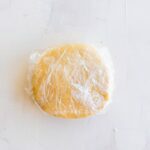 Adding apple vinegar to your pie dough makes the dough smoother and easier to work with. You will not taste the vinegar, don't worry. 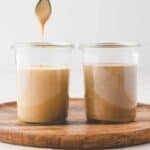 I am very happy to hear that you love my recipe Francesco!